Last week was the 100th anniversary of the Russian Revolution, a historic event that changed the dynamic of modern politics. It started in October of 1917 in Russia when the Bolsheviks, a working-class movement that was part of the Russian Social Democratic Party, rose against the government and took control of the Russian State. Vladimir Lenin, a middle-class politician, led the revolution. He wanted to establish a state inspired by Karl Marx ideology. The Russian Revolution led to the first communist state in history, a system that would spread to several other countries and which is still present today. A hundred years later, the communist thoughts that inspired Lenin to rebel against the Russian monarchs and aristocrats, still exist in Canadian universities. 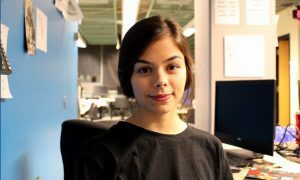 “What we [Marxists] are fighting for is a society in which the sources of life and the means of production are controlled collectively by working people themselves,” said Marco La Grotta, an accounting student at George Brown University. La Grotta is part of Fightback, a non-profit dedicated to promoting Marxist ideology among Canadian students and fighting against capitalism. Organizations like Fightback are gaining popularity at a time when millennials are becoming more critical of capitalism. A study released last year by the Victims of Communism Memorial Foundation found that 58 per cent of millennials have an unfavourable view of capitalism. 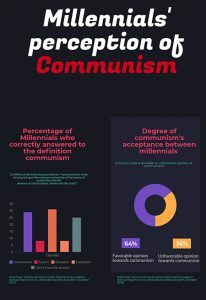 A similar study run by the same foundation this year showed that only 36 per cent of millennials hold “very unfavourable” views of communism, in comparison to 56 per cent of all other ages. The question is, do millennials really know what communism is and are they willing to adopt a Marxist way of life? The study also found that 69 per cent of youth don’t know the definition of communism. The hard task of adopting a communist life. Marx’s most popular work is the Communist Manifesto, a text that describes his views on how society should work. The manifesto is divided in two stages. First, it sets up a number of steps that are needed to reach communism’s ultimate goals: the abolition of the bourgeoisie, social classes and the state. Some of those steps include the abolition of private property, state control over the media, increase of taxes, and free education with the combination of mandatory industrial work. These policies do not match the lifestyle of most millennials, who live in an era with greater access to media outlets, as well as a diverse pool of professions – more than any other point in history. La Grotta, who identifies as Marxist, acknowledges living in today’s capitalist world involves making compromises from strict doctrine. “The fact of the matter is that, in so far we live under capitalism, we have to make do with the way the world is,” he said. Ryerson University hosted a talk on Nov. 8 about the anniversary of the Russian Revolution and what it means today. Speaker Jeremy Kinsman, the Canadian ambassador to the Russian Federation from 1992 to 1996, described the Russian Revolution as “a crime against humanity.” According to Kinsman, more than seven million Russians died as consequence of the establishment of communism in Russia. Communism accounts for some of the deadliest massacres of contemporary history. 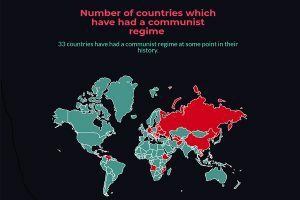 The Black Book of Communism, an investigation carried out by a number of European academics who looked into official documents of different communist regimes around the world, found that the death toll of communism amounts to 94 million people. One of the reasons communism still inspires strong emotions is that it is often discussed only in relation to specific historical events, where groups of people say they or their ancestors were adversely affected. Ukrainians, for example, remember the communism practised by Soviet Union leader Joseph Stalin imposing a famine on parts of Ukraine and on other ethnic Ukrainians. Last week, the Ukrainian Club at Ryerson organized an expo at the Student Learning Centre (SLC) in remembrance of the Holodomor, a genocide conducted by the Soviet Union in Ukraine between 1932- 33. “My grandma, who is passed now, would refused to talk about (the genocide) at family dinners or any meeting, because her idea was that children in our family should not know about the horrors,” said Sofiya Yusypovych, a member of the Ukrainian Club. An estimated 10 million people died during the Holodomor after the Soviet Union decided to expropriate Ukraine’s wheat crops and confiscated all the food from the Ukrainian peoples. Why is communism so attractive to youth? Communist regimes are known for abolishing essential human rights like freedom of speech and the right to dissent. Yoel Inbar, a psychologist from the University of Toronto, who studies how emotions affect people’s political beliefs, said that radical political ideologies find a big portion of their followers among young men. Inbar said that this is in part because young men are more attracted to danger, as they don’t have much to lose. “They are not married, they don’t have families, they don’t have a stable career, and this becomes particularly relevant when it comes to extreme ideologies where they ask you to put everything down and start over,” he said. Inbar added that part of the reason that radical ideologies appeal to young people is because those people are looking for meaning in life, and most of these radical ideologies offer solutions to that enigma. Kinsman said he believes that the reason so many youth find communism attractive is that they want a new way to do things. “They see that things are inherently unfair, and they want to see fairness. I think fairness is the strongest impulse in political societies,” Kinsman said. But LaGrotta says those who embrace Marxism today aren’t just young people philosophizing about fairness. He says communism finds favour with people today because they face genuine “misery” under the capitalist system. La Grotta acknowledged that communist regimes around the world have historically turned into dictatorships. He said that in an ideal communist state, people should have the freedom to express their thoughts and convince others about their views. Clarification: This version of an earlier story clarifies Marco La Grotta’s views on living in the modern world as a Communist. It also adds examples of how he disagrees with some of Marx’s views.